A talking tooth from Canada. 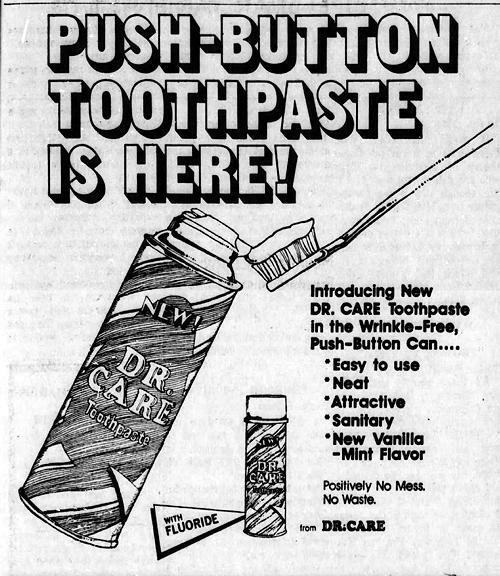 Toothpaste in a shaving-cream can. The researchers asked 24 student volunteers to each donate a T-shirt they had worn during a stressful exam, and another worn at a calm lecture. The team doused the T-shirts with a chemical that masks body odour, so that no one could consciously smell it. A separate group of 24 dental students said they couldn’t detect any difference between the two sets of shirts. Next, examiners graded the dental students as they carried out treatments on mannequins dressed in the donated T-shirts. The students scored significantly worse when the mannequins were wearing T-shirts from stressful contexts. Mistakes included being more likely to damage teeth next to the ones they were working on. So, if your fear causes your dentist to start making more mistakes, I assume that will only increase your fear, causing your dentist to make even more mistakes, leading to a downward-spiraling cycle of terror. The academic study is here. Sadistic dentist, with an eye toward cultivating future patients, gives out candy. tooth-jumping: [vbl. n. the practice of extracting a tooth with hammer and nail.] "You take a cut nail (not one o' those round wire nails) and place its squar p'int agin the ridge of the tooth, jest under the edge of the gum. Then jump the tooth out with a hammer. A man who knows how can jump a tooth without it hurtin' half as bad as pullin'" [K:] "I have told dentists and physicians in the North about 'tooth-jumping,' and they laughed at me." (Bob) "Well, they needn't to laugh; for it's so. Some men got to be as experienced at it as tooth-dentists are at pullin'. They'd cut around the gums, and then put the nail at jest sich an angle, slantin' downward for an upper tooth or upwards for a lower tooth, and hit one lick." [K:] "Would the tooth come out the first lick?" [Bob] "Ginerally. If it didn't, you might as well stick your head in a bee-gum & fergit about it." [K:] "Back teeth extracted that way?" 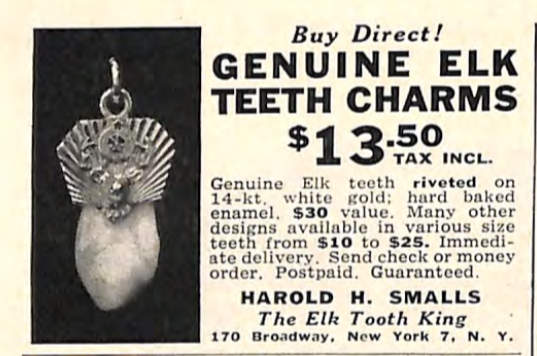 [Bob:] "Yes, sir—any kind of a tooth"
From the June 1948 issue of--what else?--the ELKS MAGAZINE. 1930: Dr. C.F. 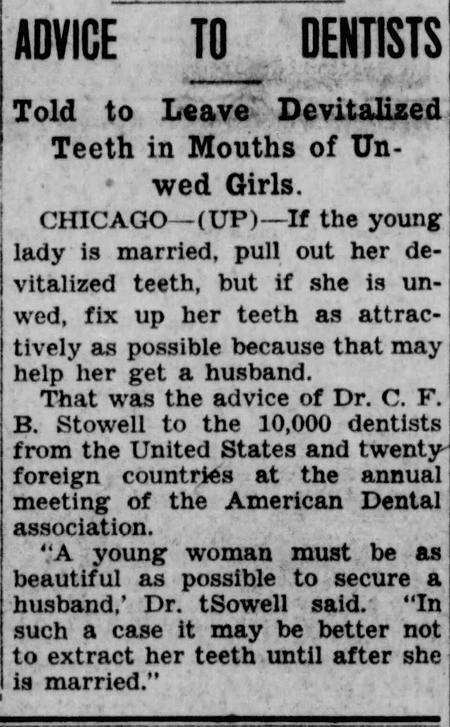 B. Stowell, speaking to fellow dentists at the annual meeting of the American Dental Association, advised that if a young woman was unwed it would be better not to pull all her "devitalized teeth," because she "must be as beautiful as possible to secure a husband." 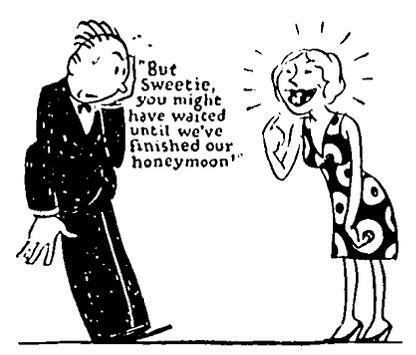 But if the woman was married -- go ahead and pull those teeth! Lurking behind this statement, I believe, was the idea of "Focal infection theory." According to this theory, which was widely held by dentists in the 1920s and 30s, infected teeth were responsible for a variety of diseases including arthritis, cancer, and mental illness. So if there was any suspicion that a tooth was infected, it was better to pull it. 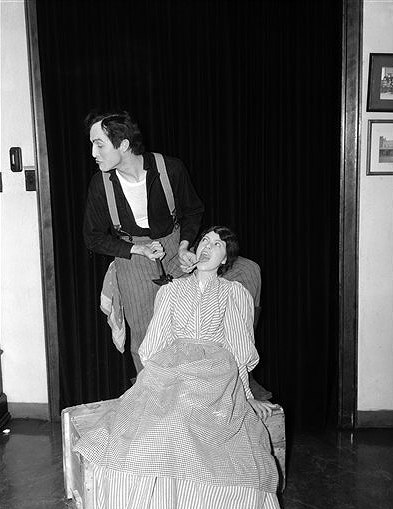 In fact, it was often better to pull all a patient's teeth, whether or not they showed any signs of problems, just to be safe. Unsuspected periapical disease was first revealed by dental X-ray in 1911, the year that Frank Billings lectured on focal infection to the Chicago Medical Society. Introduced by C Edmund Kells, the technology became used to feed the "mania of extracting devitalized teeth"... Many dentists were "100 percenters", extracting every tooth exhibiting either necrotic pulp or endodontic treatment, and extracted apparently healthy teeth, too, as suspected foci, leaving many persons toothless. 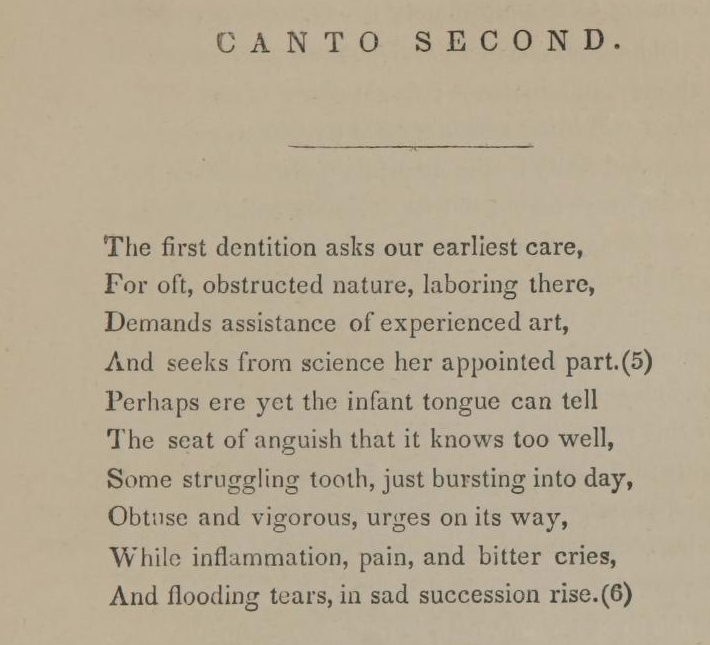 A 1926 report published by several authors in Dental Cosmos—a dentistry journal where Willoughby Miller had published in the 1890s—advocated extraction of known healthy teeth to prevent focal infection. Endodontics nearly vanished from American dental education. Some dentists held that root canal therapy should be criminalized and penalized with six months of hard labor. Horny beach bunnies switch instantly from thoughts of lust to thoughts of dental hygiene. Crazy lady told her son that if he eats all the meat she will eat his dog. Apparently, not believing her, he ate all the meat. Inexplicably she made good on her threat by starting with the poor animal's testicles which she bit off. One would think a pit bull would fight back but he just ran off screeching in pain. 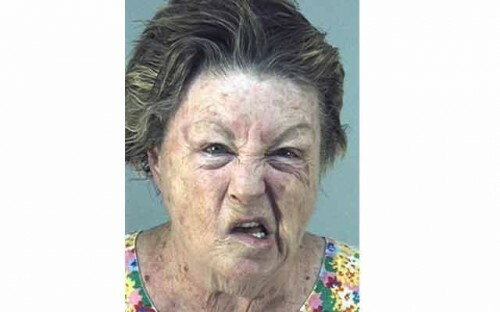 Crazy lady then used an old tricycle to knock out a witness who tried to intervene and made her son bury her with a piece of garden hose to breathe through. The last was to hide from police, not successfully. Ta Da!!!!! !